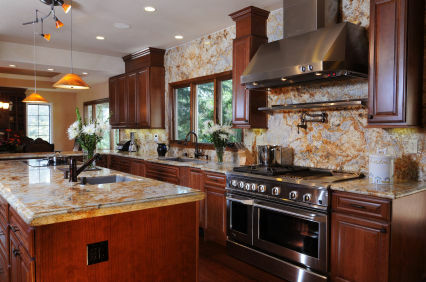 The most popular stone countertop is Granite. It is extremely durable, heat-resistant, scratch-resistant and very easy to clean. It comes in a good array of colors, and gives a very timeless look. Slabs can be as much as 10 feet long to minimize seams in larger kitchens. 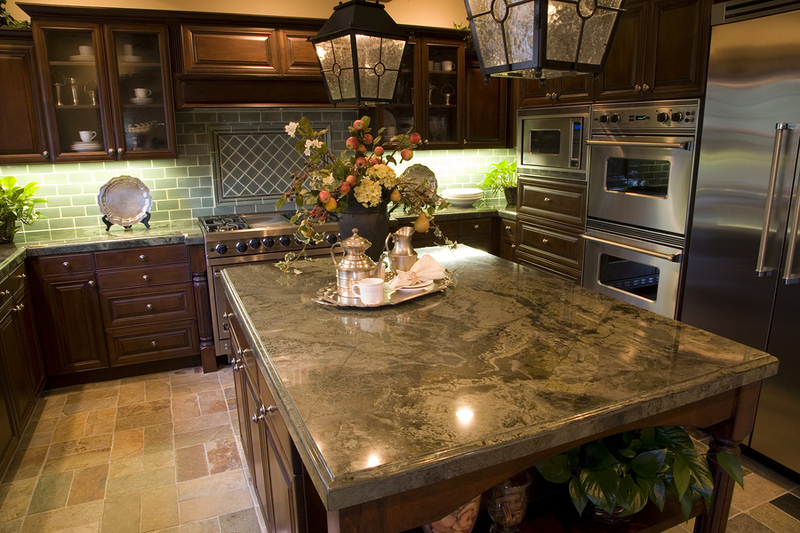 Granite should be sealed every 10 years or so for protection, but otherwise, it’s a fantastic choice that is easy to find. 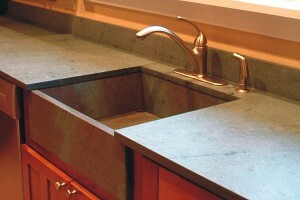 Soapstone is an interesting choice with more texture than Granite. It is a greenish-black stone that is porous, and should be sealed with mineral oil at least once a year to reduce staining. Slate, a similar, but more dense stone comes in black, green, red, grey and purple is a non-porous choice. 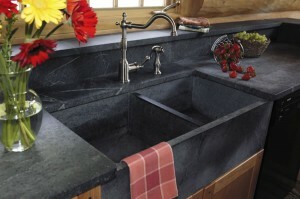 Both options can be made into sinks to match the countertop, and add a more unified look. 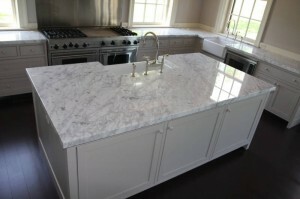 Marble is fantastic, and is especially great for bakers, as it keeps cool when kneading dough. It should be sealed periodically. 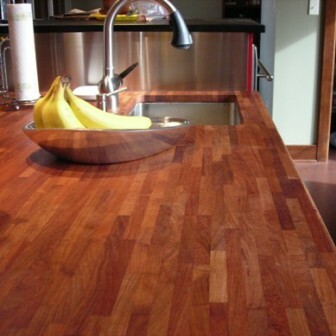 While it looks great, it can stain easily (especially my favorite, Carrara.) If you cook a lot of tomato sauce or drink a lot of red wine, you might skip this one. 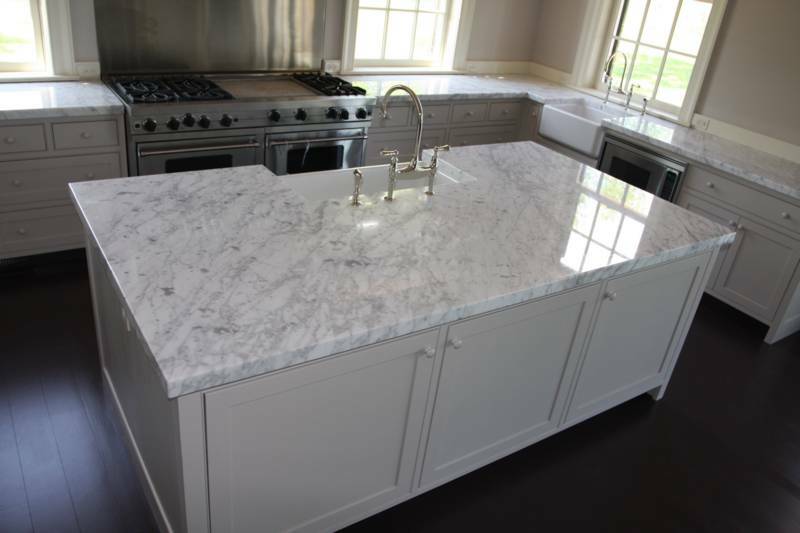 If you MUST have it, a possible solution would be to have Carrara counters in PART of your kitchen, away from the stove to cut down on splatters. Carrara, however is GREAT for Bathrooms, since water won’t stain the surface. Probably the most classically beautiful option of stone out there. 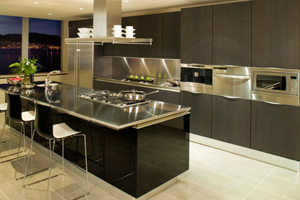 Soild surfaces (such as Corian) are man-made materials created from acrylic and/or polyester. 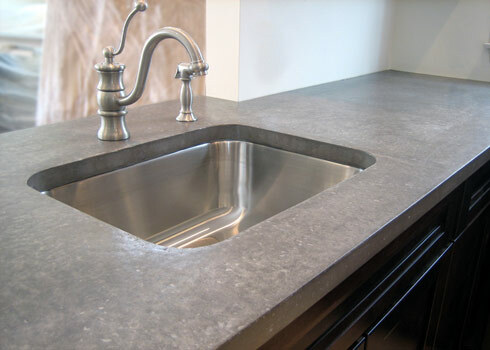 These countertops are highly resistant to scratches and can be custom molded to virtually any shape. Scratches and burns can be easily sanded out. This is a great option if you’re creating a more custom-shaped kitchen with lots of interesting shapes and curves, as the material lends itself well to these applications. Quartz is gorgeous. 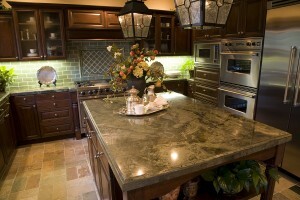 It was originally made to imitate granite and marble, but offers a more uniform look in lots of colors. It is very durable, very easy to clean, and resists scratches better than stone or marble. 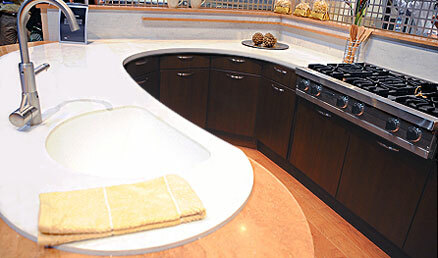 Composite Quartz counters consist of about 90% quartz material and 10% acrylic or epoxy binder. 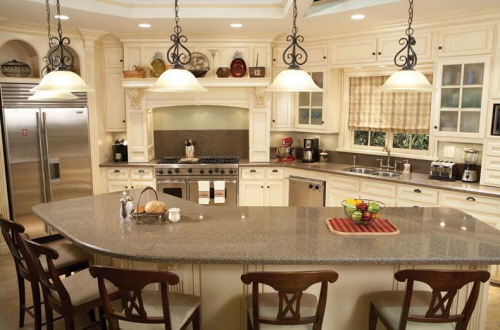 Brands such as Zodiaq, Silestone, Cambria and Caesarstone are readily available at prices similar to Granite. 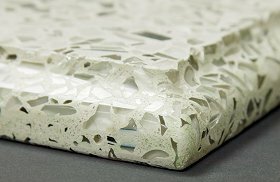 Recycled Glass is a very eco-friendly choice and one that has been increasing in demand. They are crafted from up to 80-90% recycled material, come in a lots of colors – or with one single color of glass, very very easy to clean, and are also comparable to granite in durability and price. Stainless Steel countertops are fantastic. They are naturally non-porous, anti-bacterial, durable and have a very modern industrial look. They are very easy to clean with soap and water, and should be dried with a clean cloth to reduce water spots. If you have stainless appliances, these can be a great way to coordinate a unified design in the Kitchen. Butcher Block and Wood countertops are warm and unexpected; they offer a very different application from more traditional choices. Scratches are easily sanded away, and maintenance includes regular sealing with mineral oil to protect the wood from water damage. A smaller wood countertop (let’s say 3 feet long) among stone or steel countertops in the rest of the kitchen could look fantastic!! Rock Maple, Walnut, Cherry, teak and Oak are materials that are commonly used, and with the right application can be really beautiful! Tile countertops are fun and can be as colorful as your imagination allows. They are heat-resistant and stain-resistant and a very economical choice to add a different idea in your kitchen. The tiles can chip now and then, so buy a few extra just in case. 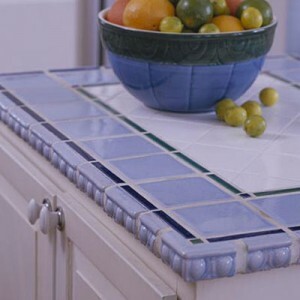 I like using tile as a backsplash: the surface then becomes easy to clean, but since you’re not handling food and tools directly on the tile, the probability of chipping is greatly reduced. Concrete is an interesting choice and can be custom made into any shape and most colors. They are durable, but very very porous, and should be sealed with wax every 2-3 months for protection. This is a great choice for a modern, monolithic look. The multitude of countertop options provides a wide range of aesthetics and functional properties. Ask your Designer to recommend the choices that fit into your own requirements, and once installed, make sure to maintain them as instructed to ensure years and years of great use! Most of all, enjoy them! This entry was posted in Home Improvement, Shopping with Joe. Bookmark the permalink.